Dairy Cottage at Hamptons Farmhouse is located in the beautifully rural area between the villages of Plaxtol and West Peckham, close to Sevenoaks and Tonbridge in Kent, the Garden of England. Amazingly quiet and peaceful, set in 9 acres of land, all that can be seen is rolling countryside, yet we are just 32 miles from the centre of London with all its theatres, tourist attractions, shopping and cultural activities. The four holiday lets include 'Stable Cottage', 'Willow Cottage' 'Dairy Cottage' and 'Little Apple Barn' all of which are beautiful conversions, finished to a very high standard and all benefit from the outstanding location and facilities of Hamptons Farmhouse. On our 9 Acre site there is so much to do: past the cottages unfolds the beautiful gardens with duck pond on which you can paddle around on the row boat. Or play open air table tennis under the shelter of the barn; take afternoon tea on the lawns or if you feel more energetic play croquet or even tennis in the all weather courts. The Hamptons Farmhouse site is very child-friendly, it is safe and secure (including the water areas) but is filled with adventure and excitement. The ‘Fort’ is a camouflaged climbing frame with swings, monkey bars, climbing wall and 40m zip wire. By the giant redwood tree, on which swings and trapeze hang, is the massive 17’ x 12’ super bouncy Jump King trampoline. The genuine gypsy caravan is a cosy place to chill out for children and adults alike. Secret dens, seven dwarf's woodland playhouse, climbing trees, treehouse in the woods, sandpits, toddler areas and playground and farmhouse animals add to the overall blissful experience. For adults, there are so many areas of the gardens and land where you can sit and read; listen to birdsong or simply wander around. Local walks abound, one passes by the edge of our land and leads you through orchards to wonderful local pubs such as the Kentish Rifleman or 20 mins rural walk in the other direction to the Swan on the Green pub restaurant with its own microbrewery for those who like to try local ales. WiFi is super fast as we have a fibre line into the property. You should get speeds of 20-200Mbs. 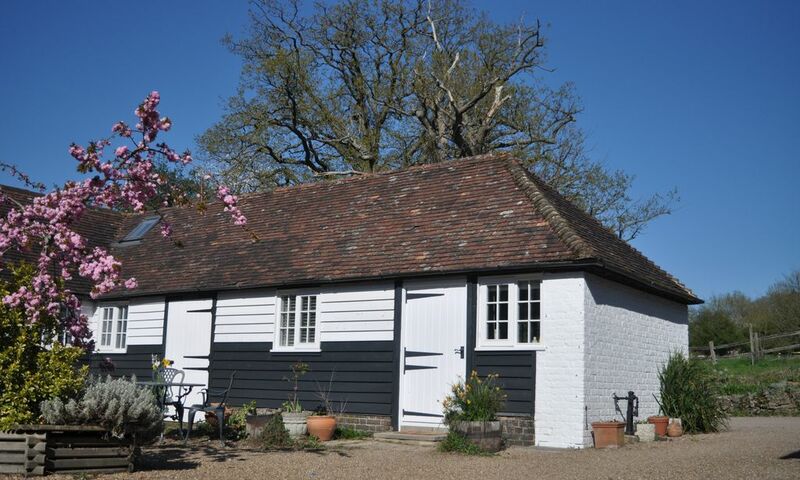 The four holiday homes, Stable Cottage, Willow Cottage, Dairy Cottage and the Little Apple Barn at Hamptons Farmhouse are the perfect retreat from the hustle and bustle of our busy lives but an easy journey to London just over an hour away and only 35 mins from Sevenoaks to Charring Cross. From there the London Eye, Theatre land, Covent Garden, Leicester Sq and West End and other tourist attractions are in easy striking distance for an evening or day out. Beautiful rural setting, with plenty of short and longer walks. Has trampoline, zip wire, sand pit, slides, swings, climbing frame, gypsy caravan, small pond with boat, full size football net, table tennis, electric car & outdoor toys for lots of different ages. The dairy cottage was really comfortable & clean. The grounds & activities were spacious with loads to do for the kids. A great find. Thank you for your review. We are so glad you have enjoyed your stay. Dairy Cottage is a rural haven, yet so close to London for day trips - but our two girls just wanted to stay on the lovely Hamptons Farmhouse grounds. They like the tennis court now but a few years ago it would have been the trampoline and zip wire. With the open barn and the gazebo (which overlooks the tennis court and other play facilities) the grown-ups have plenty of places to relax. We will be stay here again. Thank you for taking the time to do a review for us. Thank you for being such good guests. We look forward to you staying again. This was our fourth year staying at Hampons Farm. The relaxed, happy, fun atmosphere is hard to beat. Recommend to anyone. We have already booked for next year. It is a real pleasure having you visit. Thank you for your kind review. And we look forward to seeing you again in 2019. This was our first time at the Hamptons Farmhouse. We stayed with our two Kids in the Dairy Cottage: plenty of space for everybody, everything is provided for, so that we felt very comfortable. The outside premises of the Farmhouse are just stunning: Beautiful views, lots of places to sit and relax, numerous places for the Kids to Play (sand-pits, slides, Tennis court, trampolines, Little Kids houses, tree house). So the Kids can take off by themselves and the parents can relax. If you do want to get out, there are lots of Things to do and to see within 10-30mins of driving. Also, London makes a very easy day-trip from here. Overall: a Wonderful experience at a great Location with very nice hosts. Perfect escape to the country! We had a perfect stay in Dairy cottage. The cottage was really comfortable. A nice surprise were the food, wine and flowers we found on arrival. It was unusual hot weather, but the cottage stayed cool. Also it was lovely to sit in the shade of one of the beautiful big trees that grow on the property. Our children enjoyed the trampoline, tenniscourt and big swings. It was really nice to sit and watch the sun set over the hills. The connection to London by train is perfect. In a good half hour you are from Tonbridge in the center of the city. A highlight for us was the visit to the Harry Potter studios in Leavesden. We can really recommend the cottage. Katie and Andy created a really relaxed place with lots to do for children. Because of the hot weather we didn’t do as much as we wished, so we have plenty of reason to come back! A perfect escape to the country! We had a lovely week in Dairy cottage. On arrival we found food, wine and flowers and the cottage was really comfortable. The surroundings are lovely. There are seats everywhere to enjoy the view or to sit in the shade. We had unusual hot wheather, but the cottage stayed rather cool and there were beautiful big trees to sit under. The children enjoyed the big swing, the trampoline and the tenniscourt. The trainlink from Tonbridge to London was perfect. And we also went (by car) to the Harry Potter studios in Leavesden. That was the highlight of our week! We can truly recommend the accomodation and thank you for a lovely week! Thank you for your kind and thoughtful review. It was lovely having you stay in Dairy Cottage and we are glad you had such a good holiday.